Want to win tickets to Super Bowl LI taking place at NRG Stadium on Sunday, February 5, 2017 in Houston, Texas? Put your profile on the line and you could win a chance to go to the Big Game in 2017! Pick your team at pypotl.becausefootball.com, pick a challenger then share the results. If your team wins, your friend’s profile will “proudly” rep your team’s colors. If your team loses, your profile will sport a new loyalty. This might be your best chance to go to Super Bowl LI. But are you ready to risk your team loyalty? The choice is yours! 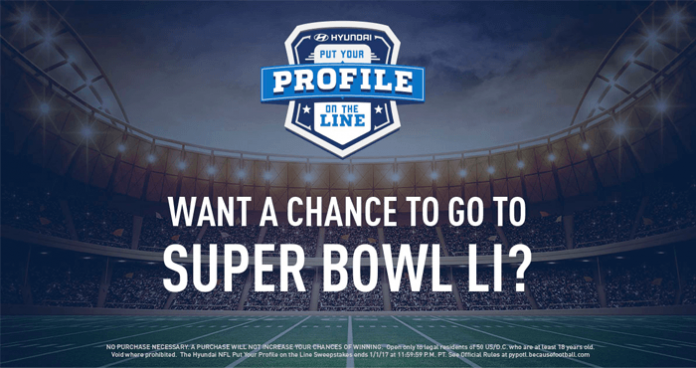 Participating into the Hyundai NFL Put Your Profile On The Line Sweepstakes is fairly easy. It only requires you to complete a few steps on the promotion website at pypotl.becausefootball.com. First, register for the Sweepstakes by connecting with Facebook. Then, pick your favorite NFL team and create your profile. As a result, you will automatically receive an entry into the Sweepstakes. Second, choose a friend to play against for each NFL game during the week. The more you play, the more chances you have. Finally, share the challenge’s result on Facebook for an additional entry into the Sweepstakes. Additionally, you will be offered the opportunity to complete three-question surveys at various time during the Sweepstakes Period. Each complete survey will result in an additional Sweepstakes entry. Each of three winners will receive a trip for two to the Super Bowl LI taking place at NRG Stadium on Sunday, February 5, 2017 in Houston, Texas. Each trip package includes hotel accommodations for 2 nights, a pair of tickets to Super Bowl LI, and ground transportation. The total approximate retail value of the each prize in this Sweepstakes is $5,500. The Sweepstakes is offered only to legal residents of the 50 United States and the District of Columbia, who are at least 18 years old or the age of majority in their state of residence, whichever is older, at the time of entry. The Sweepstakes begins on September 27, 2016 at 12:00:00 A.M. Pacific Time and ends on January 1, 2017 at 11:59:59 P.M. PT. In addition to the first Sweepstakes entry earned when registering for the Sweepstakes, Entrants can receive no more than 11 additional entries each week from participating in challenges and responding to surveys. On or about January 6, 2017, the Administrator will randomly select 3 potential winners from among all eligible entries received during the Sweepstakes Period. The total approximate retail value of all prizes is $16,500. The Sweepstakes is sponsored by Hyundai Motor America and is administered by Prize Logic, LLC. For more information on the Hyundai NFL Put Your Profile on the Line Sweepstakes, including official rules, visit pypotl.becausefootball.com now! Radio.com GRAMMYs Sweepstakes: Attend the 59th GRAMMYs!